Each year, Mary Gingrich, MD, Dallas Niermeyer, MD Emeritus and Clark Niermeyer, President, announce and congratulate a band member selected as the year's Prairie Brass person of the year for exemplary attitude, dedication, service and musicianship. Congratulations to all of the past recipients from the entire Prairie Brass Band family. 2014 - Prairie Brass Announces New Music Directors. 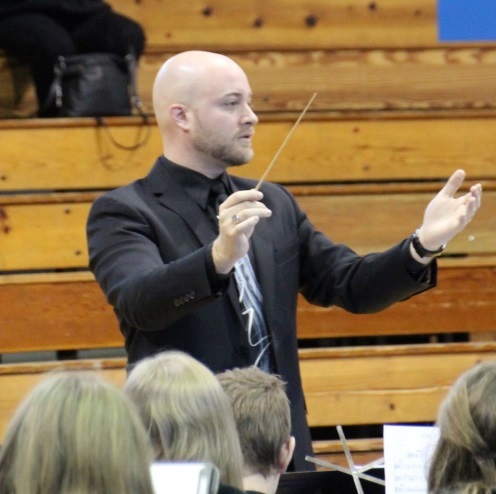 Following the decision of the band's first Music Director, Dallas Niermeyer to step down from the podium after 16 years, the band began an extensive search process. 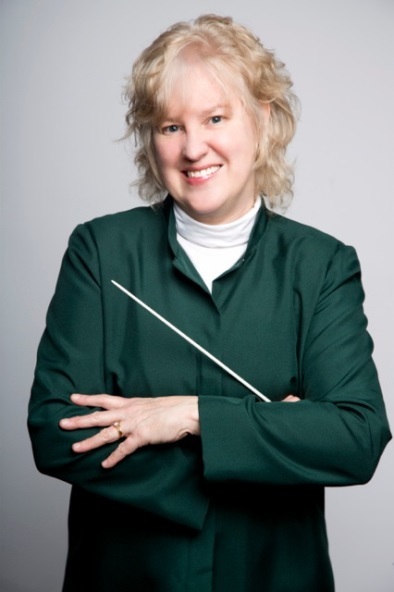 Mary Barnes-Gingrich has been a member of the Prairie Brass Band for six years, the first five as solo tenor horn and currently as conductor. She is a graduate of Northwestern University with a degree in performance (French horn); for three of her undergraduate years she was a member of the Chicago Civic Orchestra. After graduating she won The Friday Morning Music Club competition in Washington, DC, resulting in a solo performance at the Kennedy Center. While in the Washington, DC area, she was selected as the principal horn with the Northern Virginia Chamber Orchestra. After returning to the Chicago area, Mary became an active freelance player, performing at the Arie Crown Theater in Chicago for shows that included My Fair Lady (Rex Harrison), Camelot (Richard Burton) and How to Succeed in Business (Sammy Davis Jr.). In addition, she played extra horn and Wagner tuba during Chicago Lyric Opera's four-year Wagner "Ring Cycle" conducted by Zubin Mehta. Mary plays as an extra with the Chicago Symphony Orchestra and has participated in the orchestra's tours to 12 countries. She also may be heard on CSO recordings with Maestros Solti, Barenboim and Guilini. She is currently a member of the Ars Viva Symphony and the Lake Forest Symphony. An active chamber musician, she plays French horn with The Edens Brass Trio, The Mirror Quartet and the Chicago Horn Consort. Mary is also an award-winning painter and print maker (MBGingrich.com) and shows her work in two galleries in Wisconsin. Mary's first experience with a brass band came at a day-long symposium in Durham, England, where she played with the Fishburn Band. That day changed her musical life forever and sparked her undying interest in this art form. Mary's ardor for brass banding was solidified when the Prairie Brass Band afforded her an opportunity to play tenor horn. Mary has soloed twice at the US Open. In 2011 she premiered Dallas Niermeyer's new arrangement of Gershwin's Three Preludes for Tenor Horn and Band, which won the best new arrangement award at the US Open Brass Band Championships. Peter Held has worked with the Prairie Brass Band over the last two years, starting with collaborative efforts between the band and the school where he teaches, and now as conductor for this last year. He graduated from the Wheaton College Conservatory of Music with a degree in Music Education, and has had the opportunity to perform in many diverse settings, from small churches down south to the Symphony Center in Chicago. For the last three years Peter has been the music director for Christian Liberty Academy in Arlington Heights directing the high school orchestra, middle school band, and beginning band. He also teaches elementary and middle school general music, oversees the other ensembles (choir and string orchestra), and runs the school's private lesson program. He also is an active member in his church's worship orchestra, and he teaches private lessons at a local music school. The Prairie Brass Band has rehearsed in Peter's rehearsal room at Christian Liberty Academy for the last few years. After making the acquaintance of the band's director, Dallas Niermeyer, he conducted a few pieces with the Prairie Brass in a few concerts and helped to create a joint Christian Liberty and Prairie Brass Christmas concert in 2012. When the director's position opened up, Peter quickly applied and is now co-conducting the band with Mary Gingrich. 16-Mar-2011 The Prairie Brass Band of Arlington Heights, IL, USA, announces an exciting new concert agreement with School District 214 Community Education. The band has agreed to produce two concerts each year at the forest View Education Center Theatre as a part of the rapidly growing and varied schedule of concerts at the Center. Prairie is the only brass band invited to join the lineup of world-acclaimed artists and performers presenting programs throughout the year. No stranger to the venue, the band has presented concerts there three previous times featuring World's Champion Whistler David Morris from Dobcross, UK. The band kicks off its new series with a concert on March 27, 2011 featuring famed jazz trumpet artist Bobby Lewis (www.bobbylewis.com) Bobby will be performing with the band on trumpet, flugel horn, cornet, and even singing a chorus or two! Says band president Clark Niermeyer,"We are thrilled with the opportunity to present entertaining and accessible brass band music to the greater Chicago suburban area for many years to come." The performance featured solos by the following PBB members: Paul Eakley (First Baritone), Lev Garbar (Soprano Cornet), John Meling (Principal Euphonium), Jeff Phillips (Solo Tenor Horn), and Eric Yates (Principal Cornet). (November 4, 2006) - Eric Yates, principal cornet, won the award for Best Cornet at the 2006 US Open Brass Band Championships, recently held in Arlington Heights, IL. The prize for the award was a new, custom-built Courtois cornet engraved with the inscription "US Open - Best Cornet - 2006", which was provided by contest sponsors, Buffet Crampon. (November 4, 2006) - Long time bass section member and former PBB board member, Lothian Hamilton, played his farewell performance with the band at the 2006 US Open Brass Band Championships. Lothian leaves the band to move East in preparation for marriage to his fiancee this coming May. During his 9 years with the band, Lothian has played both Eb and BBb in the bass section, has served as PBB webmaster for the past six years, and has been an integral part of the organization and management of the band in his position on the PBB Board of Directors. The Prairie Brass Band thanks Lothian for many years of service and dedication to the band and wishes all the best to Lothian and his bride-to-be. (June 15, 2006) - Bette Eilers, solo cornet with the Prairie Brass Band, was recognized as a Pioneer woman brass musician by the 5th International Women's Brass Conference, held June 14-17 2006 at the Illinois State University in Normal, Illinois. Bette's impressive career began over five decades ago when she was appointed principal trumpet of the Chicago Civic Orchestra at the age of 17 and encompasses performances and recordings with such groups as the Chicago Symphony Orchestra, the Lyric Opera of Chicago, and solo performances with numerous groups. In addition, she has an extensive career as a music educator having taught at several universities, colleges, high schools, and other camps and programs. The Prairie Brass Band congratulates Bette on this honor and on her fantastic career, and we are overjoyed to have her as a member. (August 10, 2005) - On Thursday, August 4, the Prairie Brass Band awarded the first Prairie Bandperson Of the Year Award to long-serving band librarian, Carol Dickenson. The award was presented at the band's final concert of the summer season at Rotary Village Green in Buffalo Grove, IL and consisted of a mounted certificate and a gift card. The award was in recognition of Carol's dedication, devotion, attendance, performance and continued service to the Prairie Brass Band. The entire band joined Musical Director Dallas Niermeyer and the Board of Directors in a profound expression of thanks for Carol's many years of quiet service to the band. 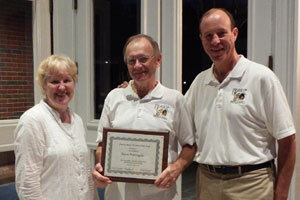 While Carol is the first recipient, the board plans to continue the award in subsequent years. Said Band President Clark Niermeyer at the party following the concert, "Carol has done an exemplary job as band librarian and it's well past time that her service and devotion to the band was publicly recognized. We are proud to have her as a member." PBB Cornetist Takes Top Prize! (March 13, 2005) - Cyndi Salata, the principal cornet player with the Prairie Brass Band, took home the title for best Technical High Brass Solo at the annual North American Brass Band Association championships held March 11th and 12th in St. Charles, Illinois. Competing against a talented field that included musicians from across the United States, Cyndi's performance was judged to be the best of the bunch!! Cyndi has been PBB's principle cornet for seven years, since shortly after the band was founded. She has competed several times in the solo contests at previous NABBA championships, but this marks the first time she has walked off with first place. So, from all of us in PBB, congratulations Cyndi - we couldn't be happier for you! !